General Electric stock price is trying to complete the eighth consecutive green week after the bounce off the 6.70 support level. The aggressive bearish rally started after the pullback on the 33.00 resistance level, driving the price towards the 6.70 low in the previous month. Moreover, the price is holding within the narrow Bollinger band in the daily timeframe as it failed to move higher after it almost touched the upper boundary. Looking at momentum oscillators on the daily chart, they suggest further increases may be on the cards in the short-term. The RSI holds above its neutral 50 line and is pointing upwards, detecting positive momentum. However, the MACD oscillator is flattening around the trigger line and is moving in the bullish area. If the bulls drive the price higher above the upper Bollinger band and the 9.20 resistance, this would likely determine a bullish correction and prices may stall initially near the 11.20 barrier, which stands near the long-term falling trend line and the 200-day simple moving average (SMA). A potential upside violation of this zone would raise the likelihood of more advances towards the 23.6% Fibonacci retracement level of the downleg from 33.00 to 6.70, near 12.87. In case of declines in the stock market, immediate support may be found near the 50-day SMA and the lower Bollinger band currently at 8.00. More losses could send prices towards the record low of 6.70, while steeper negative pressure could create a fresh lower low. 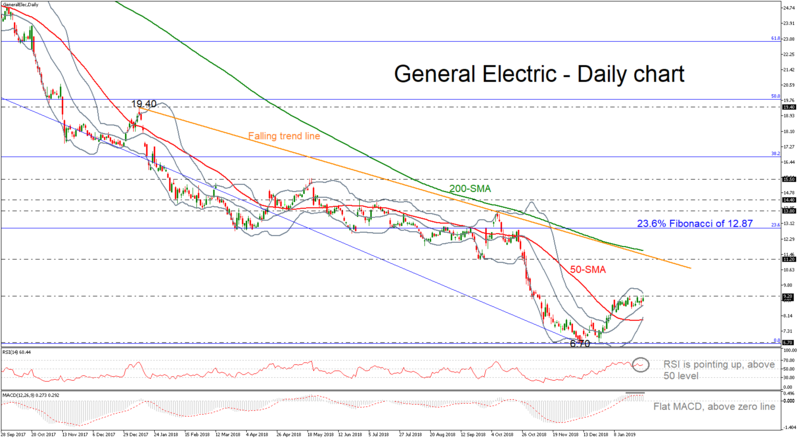 To sum up, General Electric has been trading in a strong bearish trend since January 2018, while only a rally above the 61.8% Fibonacci would switch the negative outlook to positive.